> The Beesley Buzz: #ACEforSchool Challenge – Not just for the kids clothes – shhh! #ACEforSchool Challenge – Not just for the kids clothes – shhh! One of the childhood stories I used to love hearing my mum tell me was of the time I had just started school myself and came home covered head to toe in paint. She was furious! My clothes were ruined. Mum made it quite clear to me just how much trouble I was in for ruining my clothes with my painting. Then the story goes on to tell of the open evening at school where my painting had been put on display. It had been chosen as the best painting in my whole class! My mum felt immensely proud of me but also hugely guilty about how cross she had got about the paint-stained clothes. It’s a story that has stuck with me over the years and I’ve done my best not to make the same mistake with my own children. Having previously worked in childcare, I fully recognise the importance of messy play and mark-making activities in children’s learning and development – whether that is in the form of painting or sand play, or gloop or shaving foam play, or playing with mud – the possibilities are endless. The benefits of getting outdoors and playing in nature are also widely recognised these days. So getting clothes mucky is a small price to pay and is far outweighed by the benefits of these types of play activities. And of course, there is school lunchtime. Judging by the state of my daughter’s school uniform, lunchtimes seem to consist of a large selection of tomato-based dishes; whether it’s spaghetti bolognaise, meatballs, or the tomato base of pizza, Miss T comes home wearing more of her lunch than she eats - or so it seems. Yes – Miss T’s favourite stain is definitely tomato sauce – or more accurately a multitude of tomato stains all over her white school polo shirt. Having learnt from my own mothers mistake, never have I vocalised my despair but inside my head I’m groaning “well that’s another item of school uniform totally ruined”. Having wasted far too much time in the past standing at the wash basin scrubbing at stains in an attempt to remove them before putting them in the main wash in the washing machine, I’d practically given up hope of successfully removing stains. So I was very excited to hear of ACE. I was sent ACE Stain Remover which has a spray nozzle to directly spray onto stains before washing. I was also sent a bottle of ACE for Colours which can be dosed directly into the drum of the washing machine using the cap. This product can also be used for pre-treating stains by directly applying to the stain. ACE for Colours claims to eliminate odours as well as removing stains – something rather handy with two teenage boys living in the household and bringing home sweaty P.E. Kits to wash.
After putting ACE to the test I can confirm that it really does work! As I hang out the washing I can often detect a whiff of P.E. kit but with ACE for Colours added to the wash, our washload definitely smelled far fresher than usual. The boys P.E. kits are deep colours – D’s being Navy blue and J’s a rich burgundy red colour, so I did worry about the colours fading but they’ve stayed bright. 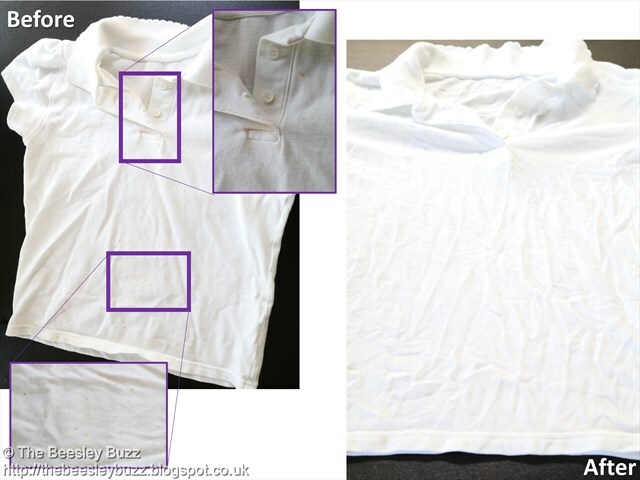 I’m all about honest testing of products on this blog so when it came to putting ACE to the test on stains I wanted to ensure we had some of the stains we normally battle with and so when Miss T came home with this splattering of tomato sauce on her polo shirt, I knew it would be the perfect test to see whether ACE really did live up to it's claims. I used the ACE Stain remover to spray onto these stains before washing and then we used some of the ACE for Colours in the wash as well. The video shows the stains more clearly than the photos. You will also have to forgive the creases - I was so excited to capture the brightness and whiteness with the stains gone that this is before ironing! This video I made really shows just how well it works - I'm so impressed! It's important to remember to treat stains before washing because sadly once stains become 'baked in' after being heated up in a normal wash without any stain remover, they do become much harder to remove. 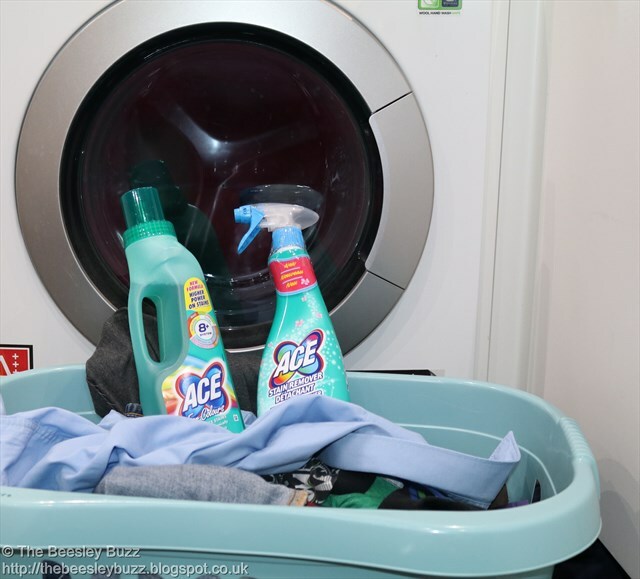 But for fresh stains ACE is perfect and we've started to use the ACE for Colours in EVERY load of washing to help remove odours and minor stains. For the tougher to tackle stains like the tomato sauce, I'm definitely going to keep using ACE Stain remover spray. And as I admitted in the video, it turns out that it's not just #ACEforSchool that ACE is perfect for - my own work uniforms have felt the benefit of ACE too! So with our uniforms in tip top condition and bright as bright can be, it's time to enjoy back-to-school season with some more fun outdoors enjoying the autumn season. This post is an entry for the BritMums #ACEforSchool Challenge, sponsored by ACE. Get help for all kinds of stains with the ACEStain Helper. 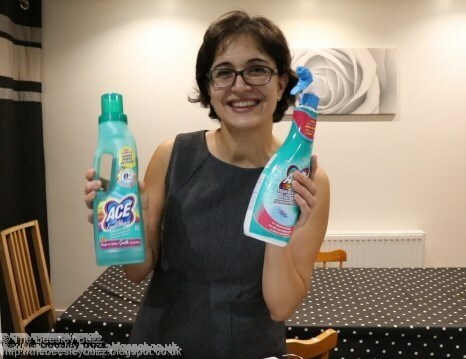 http://www.acecleanuk.co.uk/ or to buy head to your local Tesco’s, Morrison’s, Waitrose or Sainsbury’s. We were sent the above two ACE products for the purpose of this blogpost. All views are our own honest opinions.